Vacations can go one of two ways; for the planner they can be ironically stressful and vice versa for the others tagging along. If you are the unintended planner, it can be quite a feat to pull off without pulling your hair out, especially if you’re planning for a large group or your picky family members. Worry not, you just need careful planning and preparation. It will give you ample time to look for promotions and deals online. Plus you can save more for your vacation. Figure out a realistic budget. Come up with a number and try to stick to it. Don’t go out splurge and exclaim “sky’s the limit!” You still need to pay for your regular bills, rent and such after you go back from your vacation so take note of that. Have a theme activity in mind. Find activities that the whole can family can enjoy and stick to that. Do they love swimming? Are they nature lovers? Would they prefer trekking in exotic places? Think of the wants of the majority and not only what you want on your vacation. With the budget and theme in mind, you can now start searching online for vacation destinations. Look first for deals and promotions and packages first. It will be much more easer on your budget. Consider the cost, how comfortable the accommodations will be, what are the added deals and such. Don’t just stick to one destination. Have some backup. Make a checklist and compare all options. 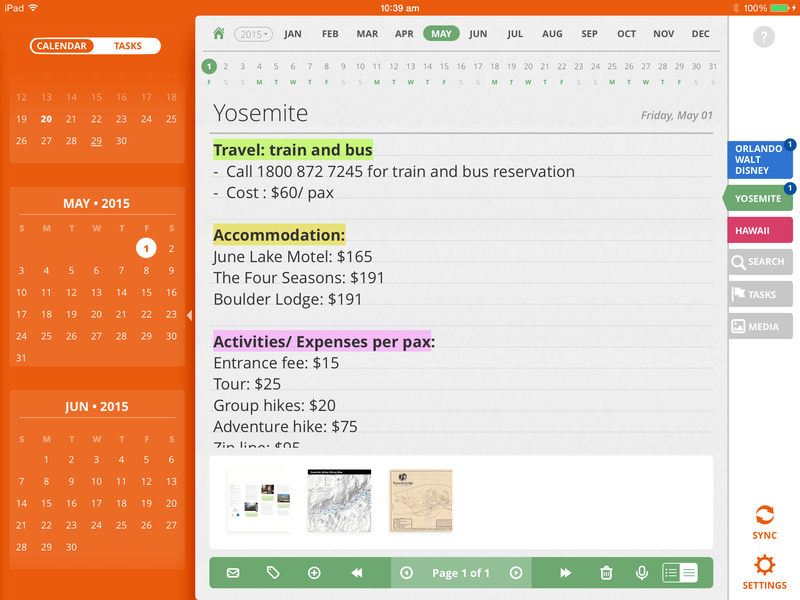 You can create several Tabs in Daily Notes for all your options and place the related details there, such as airfare cost, accommodation, a PDF of tours and packages and more. Save these options and send it to your family via email. If you’ve already finalized the destination, then it’s time to start preparing. Complete the paperwork, if needed – update passports, apply for visas, get a travel insurance plan, etc. Put all this to-do list in your notes via Daily Notes. Include also health records, phone numbers of your doctor and medical insurance company. Keep a scanned copy of your travel documents and related paperworks in Daily Notes by attaching them to your notes as a PDF. Keep up the excitement by planning your daily tours and activities for the whole vacation. You can list down daily travel plans in Daily Notes. 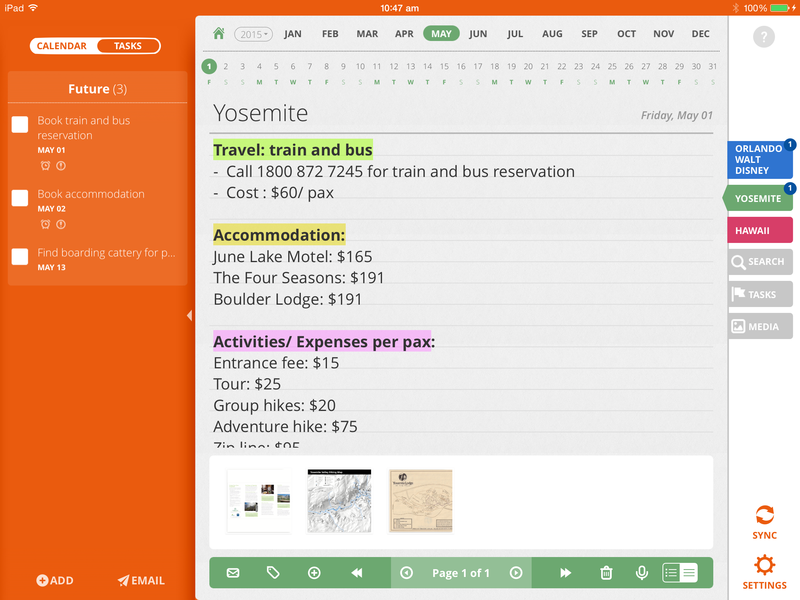 You can even attach travel brochures and guidebooks there as a PDF document. 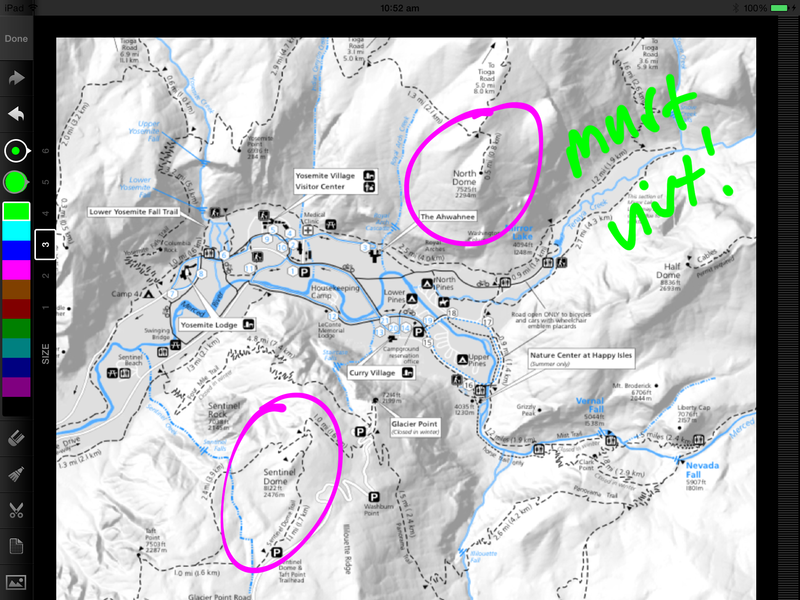 You can also insert a map image and marking up your intended visits right on Daily Notes. Carry a few additional items of clothes and underwear in your handcarry just in case your luggage is lost. Bring medicines, extra pair of toothbrush, socks, etc. You can take note of it in Daily Notes so you won’t forget. Better include a scanned PDF copy of your passports, insurance documents and related paperworks in Daily Notes as well. On the day itself, start ticking off things in your list in Daily Notes to make sure you have everything you need. Double check everything. Planning for a vacation need not to be difficult. Prepare in advance and just have the right tools with you and you’ll do just fine.